How much should we read into the 9-0 Supreme Court decisions coming down? “Specious unanimity” in two blockbuster cases. 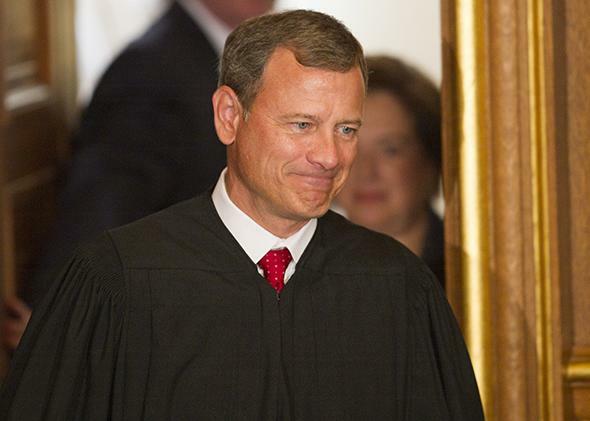 Supreme Court Chief Justice John Roberts at the Supreme Court in Washington in 2010. We know, or at least think we know, how Supreme Court terms are supposed to end: with a string of high-profile, divided decisions. That’s certainly what happened last term. Ten of the court’s final 12 decisions of the term featured dissenting opinions—including 5–4 decisions (along what some describe as “party lines”) about gay marriage, the Voting Rights Act, and employment discrimination. This term, however, something very different is happening. With only two cases remaining to be handed down, a trend has already appeared: This is the term for high-profile unanimous decisions. On Wednesday, the court decided Riley v. California, which (as Dahlia has written) unanimously held that police cannot search the cellphones of people they arrest without a warrant. On Thursday, the court handed down two of its major opinions of this year—National Labor Relations Board v. Noel Canning (about the president’s recess appointment power) and McCullen v. Coakley (about abortion clinic buffer zones). And, in a development that deserves to make headlines, both judgments were unanimous. What should we make of all this unanimity? The simple answer is that unanimity means that the court is largely in agreement. Sometimes this is true, as is the case in Riley. But that answer misses a key fact: Even when the court agrees 9–0 over a case’s holding, it can divide, sometimes sharply, over the reasoning and rule to be applied. And it is precisely this sort of division that we see in both Noel Canning and McCullen. A look at the two cases together illustrates the need to dig deeper to understand what this week’s unanimous decisions are really all about. McCullen, which unanimously struck down a Massachusetts law creating 35-foot buffer zones around entrances to abortion clinics, featured a strikingly similar pattern. Chief Justice John Roberts concluded that the law was neutral as between anti-abortion speech and other speech (thereby protecting it from the more rigorous judicial scrutiny applied to restrictions based on the content of speech). Yet he struck it down nonetheless, on the grounds that Massachusetts failed to show that there were no other ways to fulfill the law’s goals (public safety, patient access to health care, and unobstructed use of public sidewalks) without burdening so much speech. Scalia fiercely criticized this reasoning in yet another concurrence that reads like a dissent. Arguing that the law was not “content-neutral”—and in fact was blatantly discriminatory against abortion opponents—Scalia announced that he preferred “not to take part in the assembling of an apparent but specious unanimity,” highlighting the 5–4 division on the content-neutrality question. Perhaps most notably, he also accused the majority, despite striking down the ban, of surreptitiously enabling “jurisdictions across the country to restrict antiabortion speech without fear of rigorous constitutional review.” This type of rhetoric would be hyperbolic and noteworthy in a dissent. It is all the more so in a concurrence. These cases make clear a point that I’m reminded anew of every term: the peril of counting votes rather than reading opinions. Too many observers (though, thankfully, nobody at our Breakfast Table!) fall prey to the temptation to draw conclusions based on vote counts alone. As my colleague Cass Sunstein has persuasively argued, structural factors mean that we shouldn’t necessarily read 5–4 decisions as indicative of a partisan or polarized court. I’d add that this is especially true when the 5–4 split isn’t even along stereotypically ideological lines. And Judge Posner and his co-authors have made the complementary argument that, even in unanimous decisions, ideology can sometimes rest just beneath the surface. Votes alone do not a decision make. Given that unanimity of votes doesn’t correspond with unanimity of opinion, is there anything more subtle that we can conclude from the 9–0 votes in Noel Canning and McCullen? I think not. Sometimes, unanimous decisions signal judicial unity (or a strong chief’s ability to impose the appearance of unity) on a major issue of national importance—a model most famously seen in Brown v. Board of Education. Other times, narrow consensus opinions mask deep divisions that emerge a few years later, a pattern we’ve seen in the Roberts court with the voting rights cases. Yet other times, and I suspect this is the case in Noel Canning and McCullen, unanimous opinions with fierce concurrences signal only that two very different lines of judicial reasoning happen to lead to the same outcome. No more, no less.